A smooth and efficient business-IT partnership was imperative to TD Bank's successful enterprise social network deployment. Here's how they worked together to bring collaboration to more than 65,000 users. Five years ago, TD Bank Group recognized that social media was on the brink of becoming big. "We knew social would be creeping into the workforce and we wanted to be ahead of it," says Wendy Arnott, vice president of social media and digital communication. The question was how to go about it. "Our leaders have always been interested in hearing employee opinions," Arnott says. "Every time they met with employees face-to-face, they said how much more connected they felt, and how many great ideas there were. We asked ourselves, 'How do we amplify that?'" 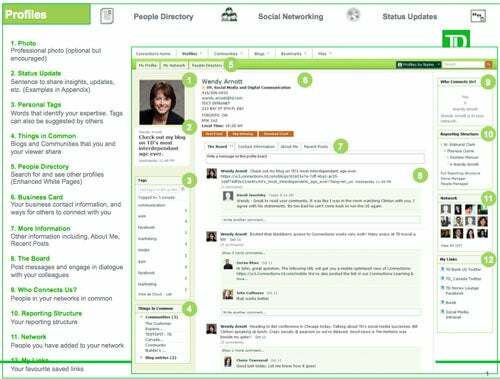 At that time, TD Bank's corporate intranet had the makings of something social, but it wasn't quite there. Arnott says employees were able to comment on items posted to the intranet, such as corporate news, accomplishments and process changes. But the company wanted something more, and started to consider an enterprise social media solution. "Enterprise social media would give us a competitive advantage: If we got employees more use to using social tools at work, los of good ROI would come of that, we thought," Arnott says. "Employees in our workforce are of many backgrounds and ages, and we wanted to capitalize on that knowledge." TD Bank started by establishing a committee comprised of senior leaders from the company's main businesses and departments, such as wealth, U.S. retail, Canadian retail, the HR department, TD Bank's CMO and its CIO, Glenda Crisp. This team, called Next@Work was tasked with rounding up requirements from the various business units. TD Bank's IT department, which is made up of 8,000 individuals and services more than 85,000 employees, had a number of requirements it wanted an enterprise social networking solution to meet. "TD has well-defined policy around vendor selection, so first we looked for a match against our business/functional requirements, which included security, compliance and privacy capabilities," Crisp says. "Then we looked for alignment to our technology standards as well as scalability, flexibility and performance. Finally, we considered the capability of the vendor to continue to develop the product into the future. This includes their commitment and ability to partner and grow with us in the future." Once requirements had been determined, Arnott says the two teams—Crisp's team and her own—came together to merge the requirements, focusing on what the business really needed and what would actually work in their organization. "We wanted to do this right and we knew the space was moving fast, but if we chose a partner that would fit in our requirements and allow us to grow over time, that would be the ideal scenario," Arnott says. Ultimately, they signed with IBM, and the project got underway in January 2011. The first phase of the project was technical, Arnott says. This consisted of installing the software in the TD Bank environment, scaling and ensuring it wouldn't cause any unintended consequences. "From a technology work effort, it was a fairly vanilla implementation that focused on ensuring all the physical environments were built and functioning correctly," CIO Crisp says. "We quickly stood up the development environment, made small enhancements to give it a TD look and feel, hooked it up to our internal directory structures, and then moved through our standard testing processes and into production." The second phase was adoption planning and change management, which consisted of determining which business units and groups had collaboration needs and would get the most business value out of being in the pilot group. To prepare the select groups for the pilot, TD Bank ran workshops with them to understand how they collaborated, then mapped back to them the opportunities they saw with features from the enterprise social network, such as blogs, wikis and file sharing, Arnott says. "It was more of a validation process so they came to agree that it made sense to them." Crisp says they were able to go live with the pilot within eight months of signing the contract. Fifteen groups totaling 500 employees were initially enrolled in the pilot, and during this time, Arnott's and Crisp's groups tweaked and refined the tools. "It helped the technology because we had real people using it in real ways," Arnott says. By the end of the pilot, 2,000 users were enrolled. "The interesting thing about social networks is they tend to spread a little bit," Arnott says. Crisp's group experienced some challenges with U.S. employees with single sign-on, but they were aware of the issue early and adjusted the project plan to resolve it, she says. Once the pilot concluded in November 2011, TD Bank brought on 50,000 users. Among the features the platform includes are profiles, which denote who employees are and their experience, among other items; tagging, specifically in profiles, lets others search for subject or skill experts; communities, which is TD Bank's collaboration forum; blogging; forums; and wikis. Today, TD Bank's enterprise social network has more than 65,000 employees who have engaged with the system, and more than 4,000 communities, blogs and wikis have been set up. "Those are really high numbers because like many retail workforces, we have a lot of people coming and going," Arnott says. As a result of TD Bank's enterprise social network deployment, some business units have seen a drastic reduction in email—by as much as 40 to 1, Arnott says. The business is also a lot more transparent, and collaboration is at an all-time high. "Employees are using the site for idea generation, suggesting policy changes and for project management," Arnott says. "Not only is it a more efficient way to work, but it helps when you work in a dynamic organization and not everyone is in the office every day. It's an easy way to bring people into projects and catch them up on the dialogue and what's happened." Arnott attributes the project's success to a number of factors, but specifically points to its partnership with IT. "If it had just been the business going off and trying to do this on their own, we wouldn't have had a good solution," she says. "It's a partnership." Crisp agrees. "There were three reasons we were so successful: First, we had strong senior executive sponsorship. This was a project driven from the top. Second, we had a business partner that was 100 percent engaged and focused on driving adoption of the product," she says. "And third, we had significant investment from IBM, which helped us resolve technical issues quickly. This was a strong example of how business and technology can work well together; how true partnership can drive business value."